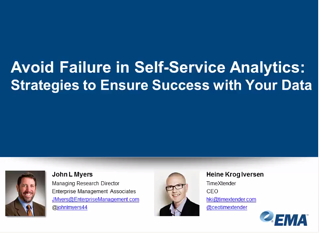 Did you miss today's webinar "Avoid Failure in Self-Service Analytics: Strategies to Ensure Success with Your Data," with analyst John Myers of EMA and Heine Krog Iversen, TimeXtender CEO? Here are the key takeaways. Let's look first at Myers' and Iversen's take on why it is that self-service analytics efforts often fail to achieve their goals. Myers told a story: in the early days of business intelligence, a business user's best tool was a spreadsheet in which she or he could manipulate data. Then desktop exploration emerged, which appeared to be a leap forward, but it often failed because it was limited in scope. It was only useful for the person with the spread mart or with access to desktop analytics. And there was another issue: desktop analytics don't scale terribly well. The time to implementation is lengthy. It takes a long time to spread analytics throughout the organization, primarily because in essence it's an attempt to replicate one person's thought process. And not everyone thinks in the same way. Additionally, the lone business users didn't always have a full understanding of the technical ramifications of what they assembled on their spreadsheets or desktops. The end report could be not only slightly but dramatically inaccurate. "If you want to scale, you need to be able to trust the numbers," said Krog Iversen. An obvious solution would be to implement standards in a controlled environment or a "walled garden," right? The trick is to remember that the walled garden doesn't have to be small. Myers invoked the Apple ecosystem, which is tightly controlled but is also highly flexible and big enough to give users and developers the freedom to move around. When users have to go to IT and get lost in the backlog, the walled garden is too small. A right-sized walled garden is expansive and flexible enough that you never even feel the need to leave it. The key, he claims, is to give the power users or "desktop cowboys" a range large enough so that they don't feel constrained but one in which metadata is captured, data quality is ensured and data lineage is traceable. When you implement a right-sized walled garden, the speed to implementation rises dramatically. One of the biggest reasons for self-service failure is the attitude of power users towards IT: "you're in IT, so you should know what to do." But IT needs to have a full understanding of what the power users are doing with the data in order to implement and maintain a useful system. And for that, communication must happen. What is most productive for self-service success is a collaborative relationship between business users and IT. When business users share how and why they need data, IT can move from being reactive to proactive. When a power user shares his favorite view, IT can reuse the process and make it available to others in the organization. Instead of power users clinging to their proprietary desktops and suspiciously eyeing anything "not created here," they can invite other users to use, reuse, test and explore their favorite reports. Power users have the ability to improve BI companywide if they embrace the idea of collaboration, teaching and sharing. In short, if business users and IT can create a feedback loop of constant communication, collaboration and iteration, everyone wins. IT can move away from its backlog and into a more strategic position, and business users can get implementations done faster. All that being said, what is the best model for a self-service BI architecture? Myers posits that it must have easy connections to all data sources and that it must be flexible. No one wants to have to rebuild the entire space every time a new data source or type of report is introduced. In the past, BI architecture was less flexible due to technical constraints. Happily, technology has evolved to the point that an optimized design is readily available not just for data storage but also for democratized data access. Additionally, data must be accessible in an understandable language for the average business users. From a semantic point of view, all the data should be labeled in a plain-language, non-technical way for ease of use. So if our architecture now has full connectivity, flexibility and a semantic model, both power users and casual users can easily access any data any time. It's important to add automation along all components so that all data is captured. Automation can reuse processes based on past patterns so that IT isn't spending all its time at the data modeling level. And now the IT department i free to focus on new challenges and strategy rather than getting lost in the weeds of BI. For a successful implementation, the automation cannot be a black box. Full transparency and access are the way to go. And with a metadata-driven approach, there is never a need to take the system down to the studs and rebuild it. The results are astounding. Myers showed that organizations using automation cut their implementation project times by more than half (52.6%) and are able to right-size their staff accordingly. In the past, adding an extra data source with hand-coding might have taken weeks or months. After all, it takes time just to understand the elements involved. With automation, the task can easily be completed in hours or days. The end result is that with that with the right architecture comprised of a centralized repository and an automated metadata-driven approach, BI can now move at the speed of business rather than the speed of IT. It's important to remember that some self-service projects can and do fail. Not every desktop cowboy project will be a success. But Chief Data Officers, Data Stewards and Data Architects can help to mitigate the risks by implementing the advice given above. A centralized architecture with an automated metadata-driven approach can so effectively increase the speed of implementation that an organization can move from being tactical to strategic--a huge marketplace advantage. How does this approach foster collaboration? It's one thing to get business and IT to work together with a constant feedback loop. When automation is added, that team can iterate almost on the fly, like a good jazz jam session. Isn't automation restrictive? Automation isn't one-size-fits-all; it's using the right tool at the right time. Done right, it will give flexibility to build out whatever you need with reliable data behind it. It's not a black box. When you implement, you can take over any piece of code with version control and find your own balance between automating tedious work while still givin business and IT control and visibility into everything. One of the challenges I face is breaking information silos in our company. How do I balance the need for buy-in with the need to actually implement a solution in a timely manner? Data silos are born when users see their data disappearing into a big, calcified blog. You can change this by having core champions who understand that data is a strategic asset and who evangelize that tenet with the message, "hey, this worked in my department." Also, it's important to understand that it takes courage to share data that you previously hoarded--so acknowledge that bravery in your new recruits. To find out more, register for our similar breakout session at Qlik Qonnections: Data Nirvana: How to Future-Proof Your Investment.